What if you could actually see Wi-Fi? It is something we all have wondered about. We can see the Wi-Fi routers in our homes and our offices, and we also know that somewhere around us are dozens of networks (just click on the Wi-Fi networks icon on your iPad or laptop) — but it is still hard to see how Wi-Fi, a technology so core to our modern connected experience, really works. This image shows an idealized Wi-Fi data transmitted over a band that is divided into different sub-channels, which are shown in red, yellow, green and other colors. The Wi-Fi pulses are shown here as multicolored spheres radiating out from the source, near the right of the image. 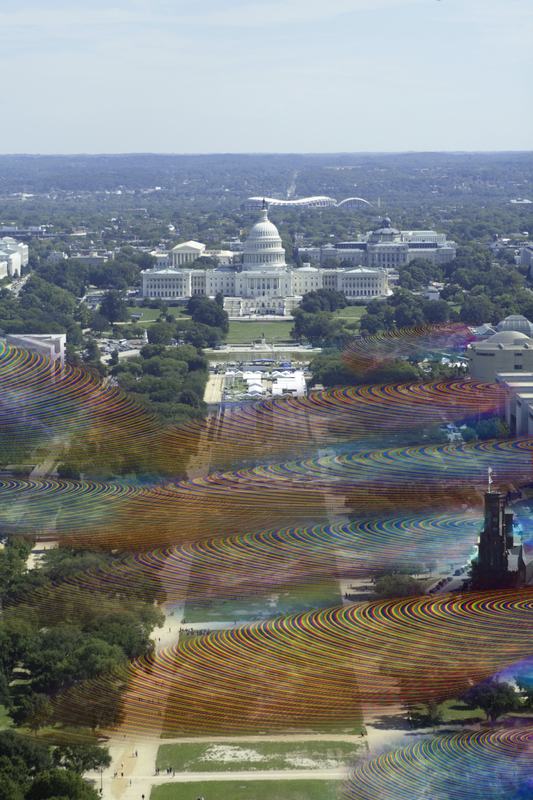 Wi-Fi waves travel through space as rapid, data-encoded pulses. A freeze frame of these pulses would show that they are about six inches apart (as shown by the lightly colored bands traveling through space in this image). This image shows data instantaneously transmitted over different frequencies from a Wi-Fi antenna as blue, indigo and yellow fields. We are all baking, enjoy it now. It would be kind of cool to see the impact of 802.11AC, where in theory, the antenna changes direction to follow the connected devices. In effect, we at least imagine that the signal bends to follow you, sort of like the eyes in the painting in the art museum. Just a thought…. Add to it all that pixs 1 & 2 are not DC;height restriction do no allow for those buildings; Central Park-NYC?? To be fair, you can see Rosslyn skyscrapers from most tourist points near the National Mall. C’mon. Where are the tinfoil hat, lead-lined boxer shorts opinions, this morning? My experience as a user is that WiFi doesn’t travel as far or as consistently as the images portray. I am uncertain why that is. Could the cost of transmission be a factor? The first image is rubbish. 1) WiFi transmits @ 2.4 Ghz. The physical wavelength at that frequency is 12.5 cm (4.9 inches for those who don’t use the metric system yet). That image shows them about 6 foot tall! Wavelength is the distance between the peaks, not the height. Why do I spend time replying to rubbish comments like yours? Get over yourself. This is as much art as it is ICT.